LITTLE ROCK, Ark. — Among the most lasting and indelible images of the civil rights movement were the nine black teenagers who had to be escorted by federal troops past an angry white mob and through the doors of Central High School in Little Rock, Arkansas, on Sept. 25, 1957. It had been three years since the Supreme Court had declared “separate but equal” in America’s public schools unconstitutional, but the decision was met with bitter resistance across the South. It would take more than a decade before the last vestiges of Jim Crow fell away from classrooms. 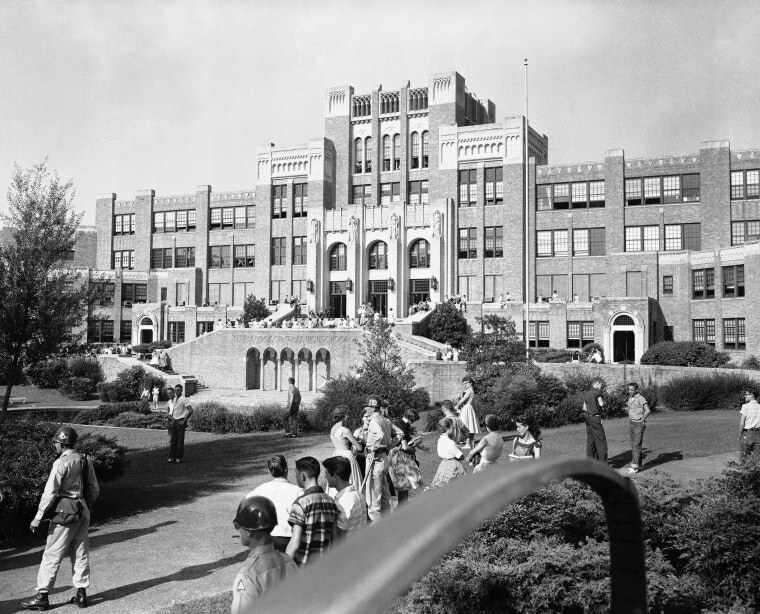 Even the brave sacrifice of the “Little Rock Nine” felt short-lived — rather than allow more black students and further integration, the district’s high schools closed the following school year. The watershed moment was “a physical manifestation for all to see of what that massive resistance looked like,” said Sherrilyn Ifill, director of the NAACP Legal Defense Fund. “The imagery of these perfectly dressed, lovely, serious young people seeking to enter a high school ... to see them met with ugliness and rage and hate and violence was incredibly powerful,” Ifill said. Six decades later, the sacrifice of those black students stands as a symbol of the turbulence of the era, but also as a testament to an intractable problem: Though legal segregation has long ended, few white and minority students share a classroom today. The lack of progress is clear and remains frustrating in the school district that includes Central High. The Little Rock School District, which is about two-thirds black, has been under state control since 2015 over the academic performance of some of its schools. The district has seen a proliferation of charter schools in recent years that opponents say contributes to self-segregation. He and his classmates came face-to-face with Southern opposition after integrating Central. The first day of school was only the beginning of the hardships they would endure. Green described the experience as “like going to war every day.” Threatening phone calls came to their homes nightly. Students threw acid on them at school. Green ignored his suggestion, knowing the magnitude of his accomplishment. Sitting in the audience at graduation with his family was the Rev. Martin Luther King Jr., then in the throes of the civil rights movement. For the 1958-1959 school year when the district’s high schools closed — known as “The Lost Year” — the remaining students either went to nearby public schools in the state or out of state where they had friends or relatives, or found other alternatives such as private schools, correspondence courses or early entrance into college. Terrence Roberts, also one of the Little Rock Nine, said the challenge his former school district now faces is just part of a larger problem nationwide for public education. In the 2016-2017 school year, the average black student in Little Rock went to a school that was roughly 14 percent white, 14 percent Hispanic and 68 percent black, according to Arkansas Department of Education data. Twenty years ago, a black student in Little Rock would have gone to a school that was 27 percent white, 1.7 percent Hispanic and 70 percent black, historical data from the National Center for Education Statistics show. Nationally, the numbers are similarly stark. The average black student nationwide in 1980 went to a school that was 36 percent white. In the 2014-2015 school year, a black student would have gone to a school that was 27 percent white. Overall enrollment in public schools has been declining, and the racial gap has widened, according to NCES. In 2004, 58 percent of students enrolled were white, compared to 17 percent black and 19 percent Hispanic. In 2014, public schools were 49.5 percent white — less than half for the first time since such data was first collected — 16 percent black and 25 percent Hispanic. Additionally, while nearly two-thirds of black and Hispanic students attend schools with at least 75 percent minority enrollment, only 5 percent of white students are enrolled in similar schools. While public schools are indeed more diverse, that diversity is including a decreasing share of white students. Community leaders have vented over the “Reflections of Progress” theme that’s been attached to the slate of events marking the 60th anniversary of Central High’s desegregation, saying it doesn’t acknowledge the backslide they’ve seen the district undergo. They’re using the milestone to call attention to the state takeover of the district, comparing it to Gov. Orval Faubus’ efforts to block integration in 1957. Some trace much of the current public school debate over school choice to what began in the wake of the Brown v. Board decision as segregationist academies, and later Christian academies, opened throughout the South in response to desegregation. Civil rights lawyer Catherine Lhamon, who now serves as chairwoman of the U.S. Commission on Civil Rights, noted that while meaningful integration happened across the country during the mid-1960s and 1970s, it was only through aggressive federal enforcement. As integration became less of a political priority in the 1980s, re-segregation emerged. Efforts by Sen. Elliott and others to stem the growth of charter schools in the district so far have had little success in the Republican state. The Arkansas Board of Education approved three new charter schools in the district earlier this month, despite a request from the district’s superintendent to hold off. “I would say pause for two years and allow the existing charter seat expansions that have already been approved to take place, allow what’s going on in the Little Rock School District to play itself out, because we have really positive things going on with our academic scores,” Superintendent Michael Poore said before the three charter schools were approved. Republican Gov. Asa Hutchinson said he believes the district is showing it can innovate and compete with the charter schools. Ifill said the unlearned lessons of Little Rock remain, and that the 60th anniversary cannot only be about lamenting re-segregation.